Shauna Buring, Pharm.D., assumed the leadership role as associate dean for student affairs in May 2016, and in July 2018, she moved into her current position as Associate Dean for Professional Education. 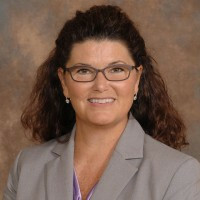 Buring joined UF following 14 years at the University of Cincinnati James L. Winkle College of Pharmacy, her alma mater. She most recently served as associate dean for professional education and assessment where she helped UC secure an eight-year accreditation from the Accreditation Council for Pharmacy Education. In addition, she has led many curricular improvements, including the development of new pharmacy practice skills lab courses and a teaching certificate program for first-year pharmacy residents in the Cincinnati area. Prior to her work at UC, Buring was an assistant professor at Auburn University Harrison School of Pharmacy. With the appointment, Buring returned to Florida where she started her professional pharmacy career as a staff pharmacist at Lee Memorial Hospital in Fort Myers from 1991-94. Additionally, she completed a drug information specialty residency at Shands Hospital in Gainesville in 1997.